Matt Cain’s Nortek Security & Control (NSC) Flagship-Certified system includes control by ELAN®, audio by SpeakerCraft®, Sunfire®, and power conditioning by Panamax®. PETALUMA, CALIFORNIA — Regarded as a key contributor to the MLB San Francisco Giants’ success over the last decade, retired pitcher Matt Cain has two World Series championships under his belt and is a possible first ballot lock for the Hall of Fame. 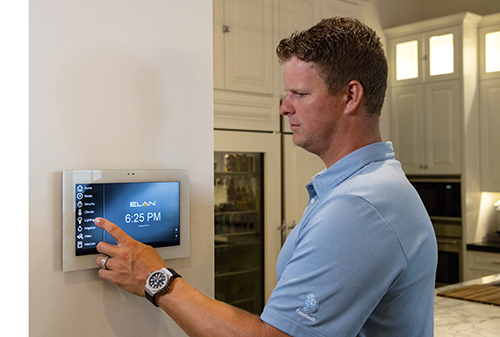 After retiring from baseball in 2017, Cain moved out of the spotlight to the quiet serenity of Paradise Valley, Arizona, where he built a custom 8,300-square foot Southwest-inspired smart home, fully equipped with an ELAN control system designed by JL Automation. Lunt and his team installed a complete ELAN Flagship-Certified System with an extended product warranty for the Cain family. The smart home infrastructure is anchored by an ELAN gSC10 Controller for whole-home system control and an ELAN g1 Controller dedicated to door intercom and gate automation. An ELAN S1616A multi-room AV controller and ELAN 8x8 HDBaseT 4K HDMI Matrix distribute audio and video throughout the entire home to several Sunfire in-wall subwoofers, SpeakerCraft in-ceiling speakers, and multiple Sony televisions. In the equipment rack, a Panamax M4320-PRO Power Conditioner protects the entire system. JL Automation installed motion detectors throughout the property that are automatically turned on by ELAN in the evening. If motion is detected, lights will turn on, and Cain will receive a notification on his smartphone. Lunt also configured a particular security event scene that allows the family to hit “Goodnight” on their ELAN touch panel, locking the doors and turning off the televisions, music, and lights. One such space is the dual game room/home theater, which includes an ELAN-controlled Sony VPL-VZ1000ES 4K Short Throw Projector hidden in a custom-made Salamander UST Miami Media Cabinet, and a Severtson Screens Tension Deluxe Motorized 16:9 11” Screen. One button press on an ELAN remote will dim the lights, turn on the projector, and ramp up the sound. “The Cain family really took advantage of ELAN’s ability to customize automation to meet their needs,” Lunt commented. Nortek Security & Control LLC (NSC) is a global leader in smart connected devices and systems for residential, security, access control, and digital health markets. NSC and its partners have deployed more than 4 million connected systems and over 25 million security and home control sensors and peripherals. Through its family of brands including 2GIG®, ELAN®, Linear®, IntelliVision®, GoControl®, Mighty Mule® and Numera®, NSC designs solutions for national telecoms, big box retailers, OEM partners, service providers, security dealers, technology integrators and consumers.